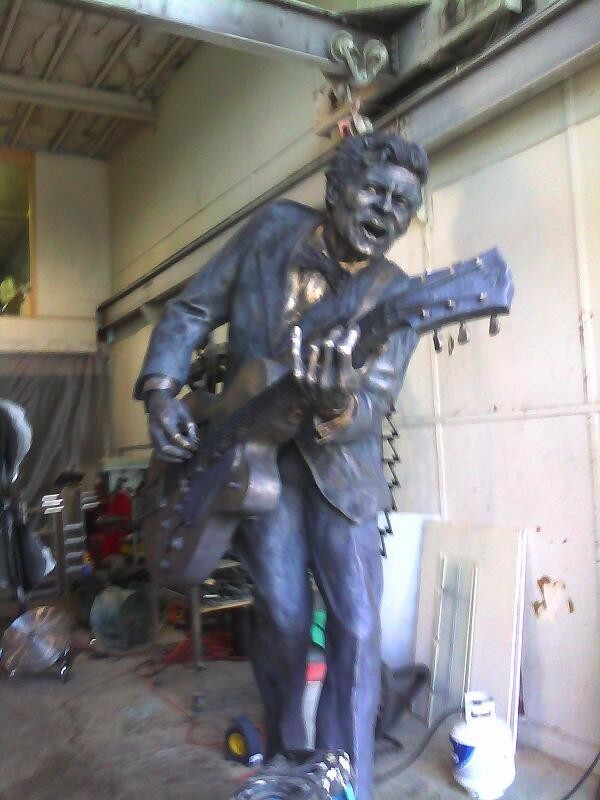 The statue of Chuck Berry set to be unveiled in the Delmar Loop is coming along nicely. A reader slipped A to Z some in-progress photos of the eight-foot-tall bronze statue, which is being sculpted by Harry Weber, the man responsible for some of the city's most iconic art. So when is the statue officially going to be unveiled to the public? Sarah Fenske called up Joe Edwards to get an update. "The statue itself is beautiful -- Harry Weber did an amazing job," Edwards says, and adds that "it's almost ready to be installed." But even if the statue's ready, don't make plans for the unveiling just yet: "There's another part of this process -- the Centennial Greenway bicycle path and pedestrian path," Edwards says. 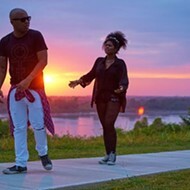 That 14-mile path is being developed along Forest Park and the Wash U campus, down Melville Avenue and then across Delmar (and eventually, all the way into Creve Coeur Park). On the north side of Delmar, at the brick arch next to Fitz's just across from Melville Ave, path developers are creating Chuck Berry Plaza. It'll be landscaped, with the plaza extended slightly onto Delmar on each side. Lyrics from Chuck Berry songs will be "etched into the granite to become part of the floor of the plaza," Edwards says. "As soon as the Centennial Greenway gets to that point of the path, the Chuck Berry statue will be installed," Edwards says. "They're putting a high priority on that intersection, so it could be as early as late October. I'm really hoping for October, because it's still kind of warm." The intersection will be the nexus of all things Chuck Berry: "His star on the St Louis Walk of Fame is right in front of Blueberry Hill, and the largest collection of his memorabilia -- all that's on display inside Blueberry Hill. "This statue should become the most famous statue in St. Louis right away. It's a spectacular statue. It's the most in-motion statue I've ever seen. He's on the ball of one foot, just about to go into the duck walk." Berry himself has seen the work in progress a few times, Edwards says. Asked what Berry thinks, Edwards demurs: "I never try to put words in his mouth, but I'm thrilled and so is everybody else who's seen it." Berry probably won't see the final version 'til the actual installation, Edwards adds. So far, they've raised roughly $85,000 toward the $100,000 estimated cost of the statue. For more information, people can check out www.chuckberrystatue.com -- and if they donate, they get an invite to the unveiling. 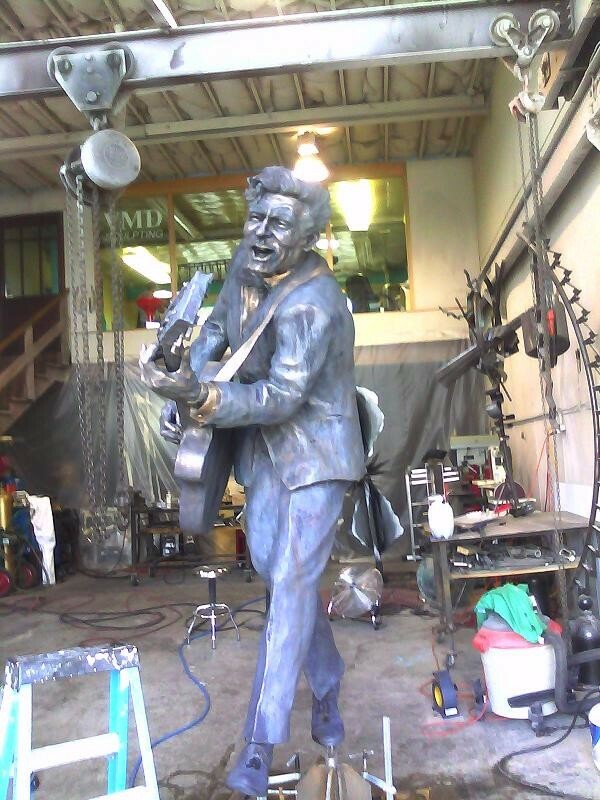 Which means donors could get to see the finished Chuck Berry statue at the same time as Chuck Berry himself.